There are always 2 shows at the Emmys. The actual progam and the red carpet. Actress Victoria Rowell showed up in a Obama-motif gown, designer unknown. Should actors wear their politics on their sleeve or on their whole body, for that matter? 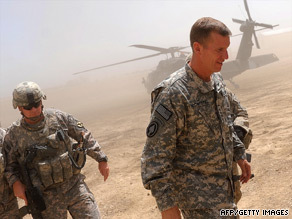 Gen. Stanley McChrystal, right, arrives at a U.S. base in Logar Province, Afghanistan, last month. As the British government rethinks it commitment to Afghanistan and Italy buries six of its soldiers killed there, public sentiment in coalition countries and the U.S. is slipping dramatically. What do you think? Is it time for a full U.S. withdrawal from Afghanistan? Leave us a comment. We'll share some of them on air in the CNN Newsroom, 11am-1pm ET.